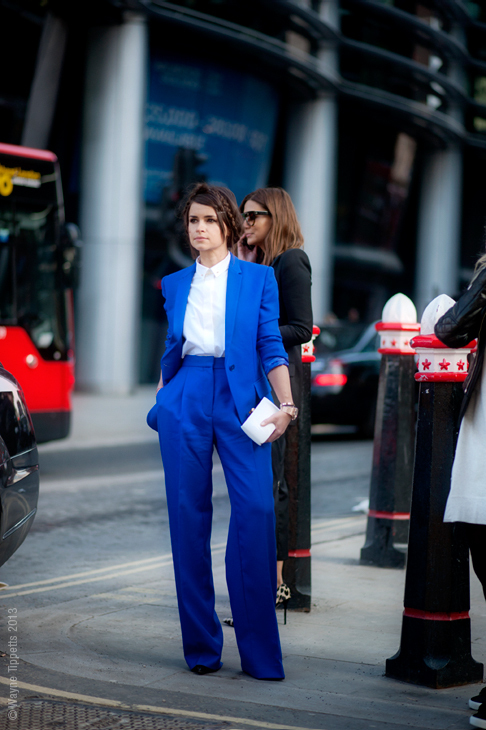 Miroslava Duma (also called Mira) is probably the most often shot fashion blogger of 2013. Numerous street style reports from the recent row of the fashion weeks around the world were loaded with Miroslava Duma’s images. Being a member of the crème de la crème, she knows the thing or two in the upscale fashion clothes. Besides she has a unique taste that allows her to stand out with her original looks. Miroslava Duma made a big appearance in the worldwide fashion industry couple seasons ago as she and 3 other Russian girls called Russian Mafia made a stir with their striking looks that were distinguished by their brilliant but yet unique taste spiced with the high end designer clothes. Miroslava Duma, Ulyana Sergeenko, Elena Perminova and Vika Gazinskaya were stalked by widely known Tommy Ton on the regular basis and nowadays they are the recognizable fashion icons of the modern times. Eh, we’re the new thing. You know how fashion is—there’s always got to be a new look, a new idea, a new story. For a moment, street-style blogs were the new thing; now they have to look for a new thing. So today it’s Russians. Being a daughter of a notable politician Vasiliy Duma, Miroslava Duma had all the advances to become widely popular. From the school age Miroslava liked the humanitarian sciences and showed an interest in fashion, which consequently became her profession. Once she graduated from the high school, Miroslava entered in the Moscow State Institute of International Relations. During her studying at the university Miroslava started writing fashion-related articles for the numerous glossy magazines. A former editor at Harper’s Bazaar Russia, today Miroslava is a freelance writer at the popular Russian magazines including Tatler, OK Russia and Glamour. Besides that, she runs her own website Buro 24/7 – style website that is getting very popular. In addition to the collaborations with Boutique 1 and Symphony, she also participated in the ad campaign “Small is Beautiful” for Louis Vuitton cross-body handbag collection. Currently Mira is an ambassador of Chanel. Regardless the short stature (Miroslava is about 5 feet tall), Miroslava manages to become the center of attention. Her obsession with color in addition to the flawless sense of style made her a worldwide known fashion icon, who was photographed by Scott Schuman for The Sartorialist and Garance Dore. When everyone prefers to cover themselves with the dark-hued clothes, Miroslava brings a splash of color with her statement color-blocking outfits that often feature angular silhouettes complemented with the extremely high heels. It never seems like she has made a lot of effort to come up with these brilliant looks. I live by that. I won’t spend a lot of time planning my outfits, even at fashion week. But I don’t have to—I mean, my talent in life is, I have a good imagination to put together an outfit. I’m not the most beautiful girl, I don’t write poems, I don’t make music, I’m not the best tennis player, but I can create a look. Miroslava’s list of favorite designers contains not only the widely popular fashion brands like YSL, Lanvin, Alexander Wanf, Miu Miu, Chanel and Prada, but also the Russian designer Vika Gazinskaya, who is also her close friend. Besides being an active socialite and donor (she is a founder of charity Mira’s Planet), she manages to be an ideal mother and wife.